WATERLOW MASTER DIE PROOF / ESSAY printed in deep blue with blank value tablets. The proof was then adopted for use as an essay for the 2½d duty with ‘2½d.’ subsequently printed in black in each value tablet, each of which was then hand-painted in bright blue with touches of Chinese white. The position of the duty plates is slightly lower than on the issued stamps. Sunk-mounted on thick card (94x120mm) which has been endorsed ‘Approved / WEB / 12/4/05’ in black manuscript. This date is three months and a day prior to their issue in Salisbury, Rhodesia. A magnificent and most attractive proof. Unique. Ex ‘County’. 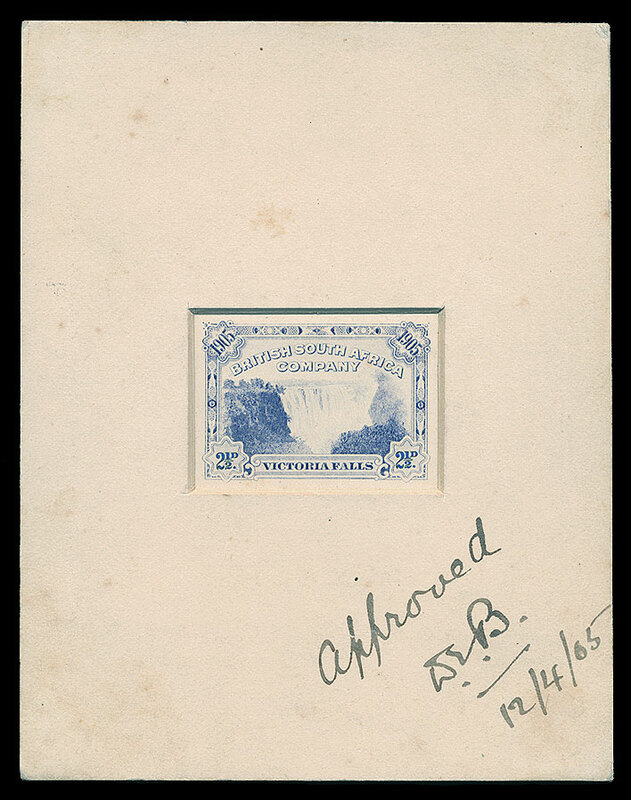 Note: although printed in a deeper shade of blue than the issued 2½d stamps, the finely printed impression gives the overall appearance of a paler blue shade.